Mexico City: New Criteria for Low Carbon Building Investment. Boost for Green Building Finance. The Low Carbon Buildings Criteria (LCB) sets out what property assets are eligible for Certification under the Climate Bonds Standard. Originally launched in 2015, the Criteria scope includes property assets like commercial buildings, residential buildings and upgrade projects. Its application has gradually expanded across cities and regions as emission performance data has becomes available. Mexico City has now been added to the list. A residential or commercial building in Mexico City is eligible for Certification if it meets the low carbon emissions trajectory or can prove reduction in emissions intensity by 30-50% (depending on the tenor of the bond) achieved through retrofit or upgrade. 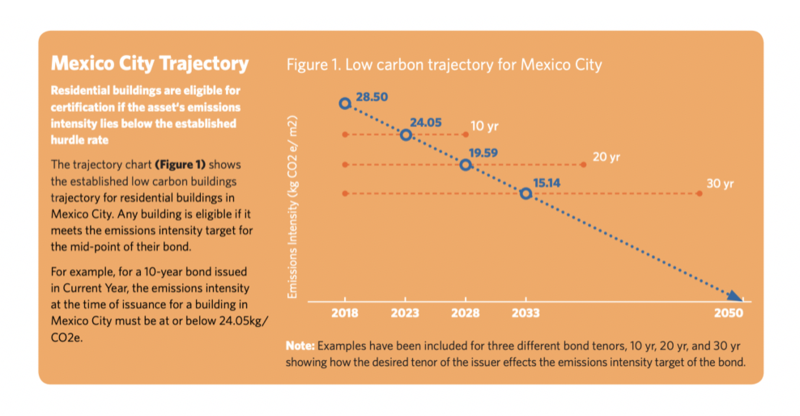 The trajectory for residential buildings in Mexico City is illustrated in the box below which also provides examples of the emission intensity levels that apply to bonds of different tenors. More information about compliance for Mexico can be found on the Low Carbon Building’s Commercial Criteria page. The Low Carbon Buildings Criteria varies by country and/or city. The variation is captured in the hurdle rates/proxy thresholds. Accordingly the LCB Criteria are location specific because emissions intensity will be affected by a number of factors. The local climate affects heating and cooling demand, and the grid’s generation mix affects the emissions factor of electrical demand, determining the building’s operational emissions footprint. In general, 70 per cent of a city’s emissions come from buildings, making them one of the biggest opportunities to reduce greenhouse gas emissions. In the long run, green property bonds are expected to make up to 40 per cent of the green bonds market but this will depend on confidence among investors that the buildings are making a genuine contribution to the transition to a green economy. With 70 per cent of city emissions coming from buildings globally, these expanding the scope of the Low Carbon Buildings criteria opens new opportunities for investors looking for opportunities that are compliant with a reduction in CO2, down to zero emissions by 2050. For Mexico City, already one the ten largest cities in the world and slated for megacity status post 2030, encouraging green building investment is vital. To find out more, use The Emissions Target Calculator on the Climate Bonds website to calculate specific hurdle rates for any tenor bond. Watch this space. We’ve been busy all through 2018 developing the Buildings Criteria and will be publishing thresholds and proxies for other cities and regions in Europe, Australia, Asia, Africa throughout 2019.